Purchase a Membership: $30 for a year, a membership helps support the sport in Alberta and your community. You also get access to all of the club's programming, river runs and training sessions. Register for an Introductory course: Start your training by taking a course. This is the best way to be introduced to the sport and learn the skills you will need to be safe on the water. You will also meet a bunch of like-minded friends to start paddling with. Come to Pool Sessions: Pool sessions are a place to meet fellow paddlers and practice paddle strokes and your roll. What better place to do that than in warm water? Register for Evening Sessions: Continue to register for coached training to help build up your confidence and skills in the water. The costs depend on the destination, but we do everything we can to keep costs to a minimum. Go Paddling: By now you will have met a bunch of paddlers who will be keen to help you progress. Go Paddling! make sure you are paddling in your skill level, but continue to refine your skills with your new paddling buddies. Take more training: Every paddler should take a few courses every year to help them progress as a paddler. If you are getting comfortable on the water, then consider taking a swift water rescue course. 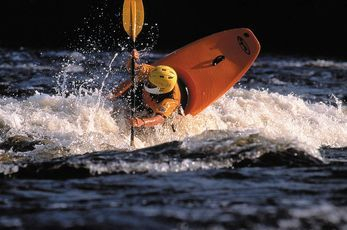 Go to a Festival: There are a number of whitewater festivals every year for you to attend, meet new paddle buddies and experience new rivers. · Your Mom has stopped saying "be careful this weekend". Kayaking Johnston's Canyon from Liam Fournier on Vimeo. You guys are really dam powerful. Downstream, as it is above. And forgive us that we have to work during the day. But deliver us from yet another lower Bow run. 10% off any soft goods*, 25% off rentals, $50 off one boat per year and $25 off courses for BVKC Members.